Malaria is a parasitic infection that is spread by mosquito bites. The malaria infection is caused by five species of Plasmodium parasites that are found in different locations in the world. Malaria is primarily found in subtropical and tropical climates. It is not common in areas with temperate climates. The species of parasite that causes the most severe disease is found in sub-Saharan Africa. Symptoms of malaria can vary. It usually takes between seven and 30 days (the average is seven to 15 days) after being bitten by the infected mosquito before symptoms develop. Symptoms associated with uncomplicated malaria include fever, chills, nausea, vomiting, headaches, and body aches. The symptoms may occur in waves sometimes called attacks. Severe or complicated malaria may progress to life-threatening symptoms such as seizures, unconsciousness, kidney failure, and failure of the cardiovascular system. With malaria, the patient develops a high fever, which comes and goes. The pattern of fevers may vary according to the species of malaria. However, there does not have to be a pattern to the fever. Initially, malaria feels like the flu with high fever, fatigue, and body aches, with hot and cold stages. Signs and symptoms in children may be nonspecific, leading to delays in diagnosis. People also may have headache, nausea, shaking chills (rigors), sweating, and weakness. Anemia is common in patients with malaria, in part due to the effects of the Plasmodium parasite on the red cells. It is extremely uncommon for malaria to cause skin lesions or rash. P. falciparum causes a particularly severe form of malaria. In addition to fever, patients may experience complications such as severe hemolytic anemia caused by the destruction of the red cells, yellow skin discoloration, kidney failure, pulmonary edema (fluid in the lungs), cerebral malaria, convulsions, coma, or death. People who have lived for years in areas with malaria may develop a partial immunity to new infections, although this will wane if they leave the area. Malaria is caused by protozoa of the genus Plasmodium and is transmitted to humans by mosquitoes. The history of malaria shows that it was difficult to determine the disease's mode of transmission. When some cultures reviewed the facts available to them, they concluded that malaria was caused by bad air without realizing that the same swamps that created foul-smelling air also were excellent breeding grounds for mosquitoes. In 1880, the parasite was identified in an infected patient's blood. There are several stages in the life cycle of Plasmodium, including sporozoites, merozoites, and gametocytes. The bite of an infected mosquito transmits the sporozoite stage of the organism to humans. The parasite travels into the bloodstream and eventually makes its way to the liver, where it begins to multiply by producing merozoites. The merozoites leave the liver and enter red blood cells to reproduce. Soon, young parasites burst out in search of new red blood cells to infect. Sometimes, the reproducing Plasmodia will create a form known as a gametocyte in the human bloodstream. If a mosquito takes a blood meal when gametocytes are present, the parasite begins to reproduce in the insect and create sporozoites that are infectious to people, completing the life cycle. P. vivax: This species is most commonly found in Asia, Latin America, and parts of Africa. Infections can sometimes lead to life-threatening rupture of the spleen. This type of malaria can hide in the liver (this is called the "hepatic phase" of the life cycle). It may then return later to cause a relapse years after the first infection. Special medications are used to eradicate P. vivax from the liver. P. ovale: This species is rarely found outside Africa or the western Pacific islands. Symptoms are similar to those of P. vivax. Like P. vivax, P. ovale can hide in the liver for years before bursting out again and causing symptoms. P. malariae: It is found worldwide but is less common than the other forms. This form of malaria is hard to diagnose because there are usually very few parasites in the blood. If untreated, the infection can last many years. P. falciparum: This is the most life-threatening species of malaria. Although present throughout much of the tropical and subtropical world, it is particularly common in sub-Saharan Africa. P. falciparum is resistant to many of the older drugs used to treat or prevent malaria. Unlike P. vivax and P. ovale, this species does not hide in the liver. P. knowlesi: Found predominantly in Malaysia, the Philippines, and Southeast Asia, this species can also cause high levels of parasites in the blood, leading to organ failure or death. Ticks are often found in plants and brush, and can attach to and bite people and animals. 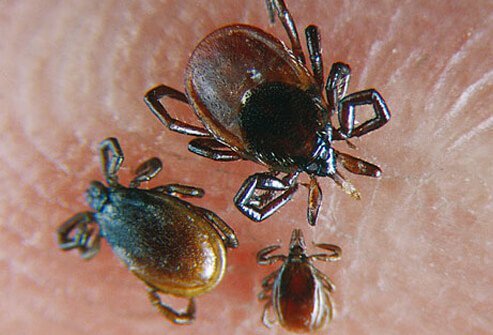 Most tick bites are not harmful; however, ticks can carry serious diseases including Lyme disease and Rocky Mountain spotted fever. Bowel regularity means a bowel movement every day.